Deliverability 101: Getting cozy with IP and domain warm-ups. Now that we’ve looked at IPs and we should have a good understanding of what domains are, the next piece of this puzzle is understanding how to effectively send email from them. The easiest way to think of it is this: Would you ever try to brew hot tea without heating up your water first? No, because it just doesn’t work like that. Think of your email programs much like that, with your IPs and domains as the water needed to brew email-success tea. Yum. A warm-up plan is a gradual introduction of your brand and sending practices to a receiving internet service provider (ISP). ISPs control the recipient’s mailbox and are the first line of defense against potentially malicious mail. This filtering system learns and creates individual reputations for senders based on known or expected volume, authentication set-up, and recipient engagement. Volume is associated with the sender’s IP (or multiple IPs, depending on your setup), listed in the email header. Authentication factors into correctly implemented forms of identification like SPF, DKIM, and DMARC. Subscriber engagement creates a web of information for a filter to make decisions of placing mail into spam, the inbox, or rejection. In this case let’s break reputation warm-up into two overarching themes: IP and domain. What happens during a warm-up? During an IP warm-up, a sender begins to introduce their expected volume to the receiving ISP. By slowly sending to increasing volumes, an ISP has the time to build a meaningful reputation based on authentication, user engagement, and any other associated impacts (think blacklists or previous positive/negative sending history from the IP(s)) instead of making a snap judgment. Sending full volume from an IP with no history shows an ISP that a sender may be trying to push as much mail through as possible, then drop to a new IP if the response is poor. This kind of behavior is extremely common amongst spammers. Spammers are not trying to build a lasting, sustainable reputation for their brand so they can simply destroy the reputation of their IPs (and domains) by sending as much mail as they can, as fast as possible. A slow volume ramp-up allows the sender to assure the receiver these are your true subscribers who have interacted with your mail. As such, it is safe for the receiver to allow more mail through. 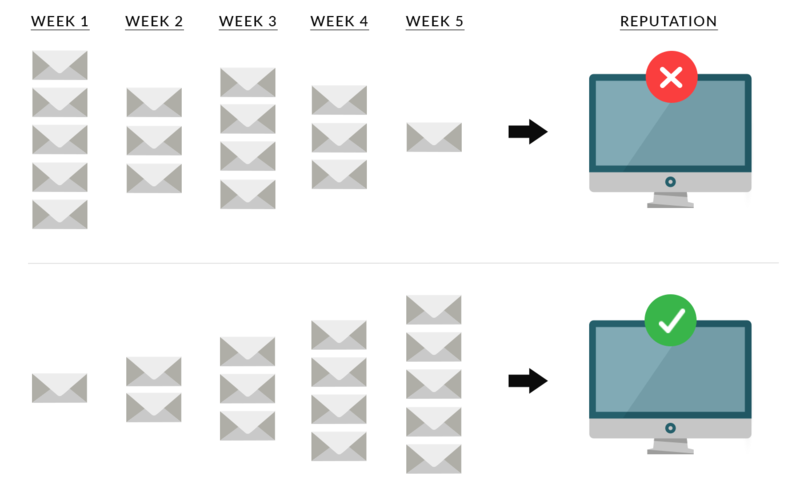 Domain warm-up is similar in concept, as this is a representation of your brand’s mailing practices. A new domain (or subdomain) creates an identity. That identity needs to build a recognizable reputation. Domains are associated with content fingerprinting and domain-based blacklists, as well as complaint rates and URL scanners. Domains represent the history of senders’ mailing practices. Warming up a new domain or subdomain is less about the volume of mail and more about brand recognition with your subscriber base. If a subscriber recognizes your name from your domain, they are more likely to trust the received mail. An IP warm-up strategy consists of sending to a small number of engaged recipients first, slowly increasing the size of your list over a period of weeks until your full list is reached. The goal here is to introduce your new sending IP(s) to an ISP with the intent of showing them your mail is not only trustworthy, but their users want and engage with it. This may take time, and it will depend on the current health of an IP and the size of your subscriber base. The best practice for warm-up is to work with and be supported by your email service provider (ESP) professionals. Different ESPs will have custom-built strategies to work best with their mailing infrastructure. Warming a domain involves making sure your audience knows and expects mail to come from you. When someone subscribes, this is the perfect opportunity to interact and tell them who to expect mail from. If you plan to transition to a new brand, send an email from your current brand introducing yourself and your affiliation. Inform your subscribers that the mail they receive is still from you. The goal is to always stay recognizable to your subscribers and maintain their trust. Overall, warming up allows you as both the sender and the brand to build a lasting and trusting reputation with receiving ISPs. While it may seem like a long, arduous process, it’s only a few short weeks to get back up to sending your full volume at maximum potential. If you need more guidance, check this out, too. Remember: A warm-up is a look into your IP and domain sending practices. Before you begin the process of using a new IP or domain, check the status of their sending health. Utilize domain and IP blacklist checkers to resolve any active issues and set-up expectations. Once you’re looking healthy, start that slow ramp in. Follow your ESP’s plan and build up to that inbox while monitoring your email metrics and adjusting volume as needed. Sloan is a Solutions Consultant at 250ok, where he serves as a go-to resource for customers and employees alike. With more than five years of deliverability and email privacy experience, including direct knowledge from Marketo, he provides expert insight on optimizing and improving email programs across the globe.